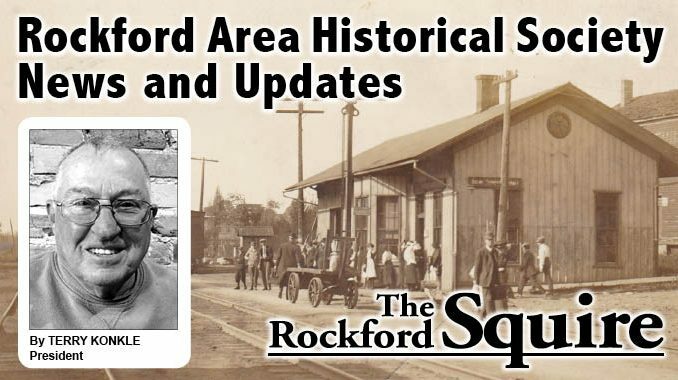 Several e-mails and phone calls have come my way concerning the library history in Rockford. John Oatley, class of 1943, called to add information about the library, which immediately preceded the Krause Memorial Library. It was located in the back of the “Municipal Building” on East Bridge Bridge Street. That location also housed the city offices, the fire and police departments and also the court facility. The location is where the bowling alley is today (2017). Rich Mol contacted me to tell me he had a document that called the area where the Krause Library was built “Battery Park”. Can anyone add more information on that name? I also was reminded by some of Edna Haner, librarian at both libraries, and Zell Gill, longtime head librarian at Krause Library. Both ladies were well-known, influential, positive people. About a month ago, an e-mail from Dan Gordon of Lowell asked if I knew the location of a business called McQuarrie Motor Sales in Rockford. He has a wooden cigar lighter with that name on it plus “Rockford’s Ford Dealer”. He wondered if the company was an inhabitant of the “Ford Garage Building” in our town. I asked Ken Ploeg, a man with lots of Rockford history knowledge and especially an expert on the Ford Garage. Ken told me that his dad purchased the Ford business from Mr. McQuarrie. Many Rockford residents will recall the garage that used to occupy part of the block between Bridge and Maple Streets on the east side of Main Street. 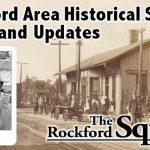 The building was purchased by the city of Rockford, torn down and the location became a city parking area. Recently Mary Eadie, long time Rockford resident and Rockford City Council member gave me a folder with several Rockford school documents in it. Athletic programs, school dedication handouts and newspaper clippings were included. One program came from a fundraiser basketball game between the Canadian “Harlem” Diplomats and the Rockford Faculty. It was played at the Rockford Senior High School gymnasium on November 22, 1961. The “Diplomats” were like the Harlem Globetrotters and the shortest player on their roster of seven was 6’0″ with four others at 6’6″ or taller, so they won the game I am sure (do not remember the outcome). The game program lists the members of the “Faculty” team using nicknames for each participant. Readers might find the roster interesting and humorous. It consisted of: “Sticks” Wenzel, Yogi Baer, “Hillsdale Flash” Rutledge, “Custer” Lobdell, “Musty” Verduin, “Bean Pole” DeRyke, “Tonto” Thompson, “Brief” Case, “Little All American” Konkle, Tom “The Bomb” Weeda, “Fierce” Lyon, “Canvasback” Lindeman, “Sandy” Sherman. Frankie” Hoopy, “Maestro” Lorch, Maurie Arnold and “Cookie” Lindhout. The coaches were Sam Benham and Fred Schultz. Thanks Mary for the memorabilia. In closing, remember to consider the Rockford Area Historical Society fundraiser raffle which is going to occur on December 1, so there is still time to get tickets. We could use the support. Please contact me with questions, comments, concerns, ideas and for sure corrections by phone at 616-866-0530 or e-mail (tnjkonkle@hotmail.com). Have a great week!